AOMEI PXE Boot Tool Download Free Booting Multiple Client Computers is available on hitnfind to download free. 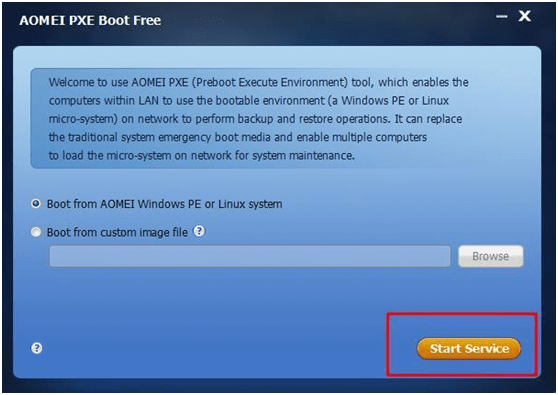 The AOMEI provides free tool for pxe boot for multiple client computers with the help of AOMEI PXE Boot Tool Download Free Booting Multiple Client Computers free software. If your system fails to boot up when you created a recovery disk for your computer, That will be annoying. If you have a lot of computers maintained within a local area networks (LAN) and they doesn’t have a CD-ROM drive nor an USB ports. What will you do when all system fails to boot up? AOMEI PXE boot is an easy way to install operating systems on a lot of computers at once. You can boot up multiple client-side computers within LAN over the network boot from ISO image file on a server-side computer for system maintenance and optimization with AOMEI PXE boot. Now AOMEI PXE boot has been updated to 1.5. A cybercafé or enterprise often need to buys any computers, which are bare metal. So if you are a manager in charge of installing or maintaining system on those computer, maybe you have to consider use AOMEI PXE Boot Tool to boot computer. Support bootable micro-system created by you. You can maintain the computers with LAN through network boot with your micro-system if you have a mighty Linux bootable ISO or Windows PE bootable ISO. If you install AOMEI PXE Boot to a master computer, you can select an image file and then start service. Set client computer BIOS boot mode as “Network boot”.